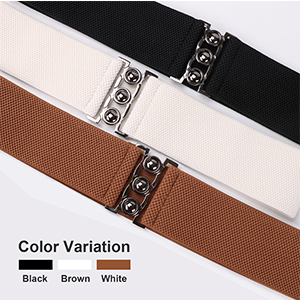 Size Fits Waist size 26"-30" Fits Waist size 31"-34" Fits Waist size 35"-38" Fits Waist size 39"-44"
▶Material◀ - Wide Elastic stretchy band belt with zinc alloy metal buckle (70%Polyester + 30%Spandex ), which makes this belt more durable and wear-resistant. ▶2 Pack ◀ - One order for two hot sale style women cinch wasit belts in reasonable price. ( Black/White, Black/Black , Black/Brwon). Different color choose makes your outfit more charming. ▶Size Of Elastic Womern Belt ◀ - With of the wide waist drees belt 4.8cm/1.8inch, and the length of the cinch belt fro women 65cm/75cm/85cm/95cm, perfect for waist size 28”-30”/31”-34”/35”-38”/39”-44”. ▶Easy To Match ◀ - Shapes your waist well, Suitable for your formal or casual wear in any season. A perfect women cinch dressy belt for any outfits. The stylish design makes waist belt easy to fit different girls and ladies in different age. ▶Order With No Risk ◀ - Our mission is for you to be fully satisfied with your women belt. Therefore, we offer 45 days for free exchange and returns. Also, all our items have 180 days warranty. Features Of The Elastic Women Waist Wide Belt. Elastic Band(High Stretchy ) - Quality well made. Stylish Vintage Buckle Design - Classic buckle, never out of time and easy match. Well Stretchy - Quality stretch elastic strap, flexible on size. Fits your all outfits and dress in any seasons- Make your outfit look unique and classy. Outstanding after-service,45 days free exchange and 360 days quality ensure . One order for two hot sale style women belts in reasonable rate . ( Black/White, Black/Black , Black/Brown). Different color choose makes your outfit more charming. There may be a little color difference due to the different light and computer display. Please allow 1 inch measurement error due to different measurement methods. Wide Elastic stretchy band with zinc alloy metal buckle (70%Polyester + 30%Spandex ), which makes this belt more durable and wear-resistant. One order for two hot sale style women belts in reasonable quotation. Different color choose makes your outfit more charming. Shapes your waist well, Suitable for your formal or casual wear in any season. A perfect women dress cinch belt for any outfits. The stylish design makes waist belt easy to fit different girls and ladies in different age. Our mission is for you to be fully satisfied with your women belt. Therefore, we offer 45 days for free exchange and returns. Also, all our items have 180 days quality ensure. Fashion wide stretch waist belt, perfect for any seasons( Spring, Summer, Autumn,Winter), also for any formal and casual outfits.